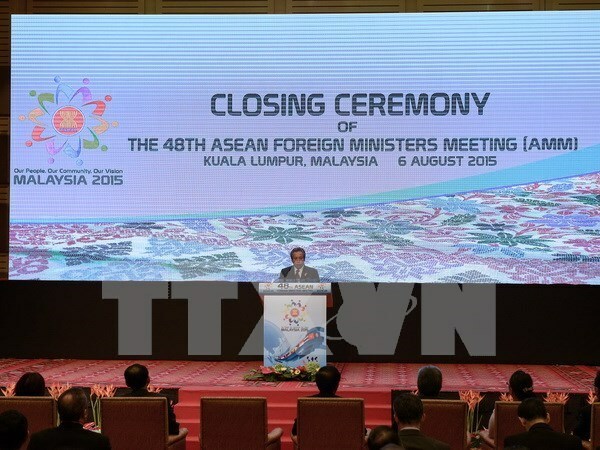 The 48th ASEAN Foreign Ministers’ Meeting in Kuala Lumpur, Malaysia, issued a joint communiqué at its conclusion on August 6, in which they voiced serious concerns over recent and ongoing developments in the East Sea (internationally known as South China Sea). “We discussed extensively the matters relating to the South China Sea and remained seriously concerned over recent and ongoing developments in the area. We took note of the serious concerns expressed by some Ministers on the land reclamations in the South China Sea, which have eroded trust and confidence, increased tensions and may undermine peace, security and stability in the South China Sea. “We reaffirmed the importance of maintaining peace, security, stability, and freedom of navigation in and over-flight above the South China Sea. We emphasised the need forall partiesto ensure the full and effective implementation of the Declaration on the Conduct of Parties in the South China Sea (DOC) in its entirety: to build, maintain and enhance mutual trust and confidence; to exercise self-restraint in the conduct of activities that wouldcomplicate or escalate disputes; to not to resort to threat or use of force; and for the parties concerned to resolve their differences and disputes through peaceful means, in accordance with universally recognised principles of international law, including the 1982 United Nations Convention on the Law of the Sea. “We looked forward to the effective implementation of the agreed Early Harvest Measures to enhance mutual trust and confidence as well as to build a conducive environment for the maintenance of peace, security and stability in the region. We tasked our Senior Officials tocontinue workingon this matter, and to further explore other initiatives, in pursuit of these objectives. “While noting the progress made in the consultations on the Code of Conduct in the South China Sea (COC) , we reiterated the importance of expeditious establishment of an effective COC. To this end, we welcomed the recent outcome of the 9th ASEAN-China SOM on the Implementation of the DOC whereby they agreed to proceed to the next stage of consultations and negotiate the framework, structure, elements as well as to address crucial, difficult and complicated issues relating to the proposed COC. We, therefore, tasked our Senior Officials to follow up and work closely with China on this matter. “Pursuant to the full and effective implementation of the DOC in its entirety, and while the work towards the expeditious establishment of the COC are undertaken, we agreed that preventive measures should be undertaken to address developments in the South China Sea, with the objective, among others, to enhance trust and confidence amongst parties . “We took note of Indonesia’s proposal to establish a hotline of communications at the high level in the government between ASEAN and China to address emergency situations on the ground that need immediate intervention, which aim to immediately reduce tensions on the ground.